As you journey south from Stockholm along the Baltic coastline towards Malmö it is hard not to be captivated by the natural beauty of the country. Here you'll find lush rolling hills, lakes which just call for you to dive in, charming fishing ports, island archipelagos, the natural park of Stenshuvud and medieval towns and historical sites; of which Borgholm, Karslkrona, Ystad and the Megalithic monument of Ales Stenar are highlights. This is a region bursting with colour and is a hive of activity all year-round. On arrival at Stockholm Arlanda airport, you will be transferred to the Victory Hotel in Gamla Stan, the historic centre of Stockholm. Victory Hotel, Stockholm and surrounding countryside. The Victory is the flagship of the Bengtsson family's private hotel chain and one of Stockholm's most elegant hotels. Days at leisure in Stockholm. Stockholm is one of the most crowded museum-cities in the world. The most renowned is the National Museum, home to Sweden’s largest collection of art. Our personal favourite is the Vasa Museum which details the story of the ‘Vasa’ ship which sank in the harbour of Stockholm in 1628 and includes the excavated ship itself. Collect your hire car and drive to the coastal town of Trosa. Your drive will take you into the rural region of Sörmland, home to the 1000km Sörmlandsleden walking trail, the 14th century Nyköping Castle and the Stendörren nature reserve. Trosa Stadshotell and Spa, Stockholm and surrounding countryside. The Stadshotell and Spa is located in the heart of the idyllic coastal town of Trosa, 45-minutes drive from Stockholm. Free time in Trosa. Take a gentle stroll along the town’s canals and visit its small handicraft shops. Alternatively, use your car to visit one of the region’s manor houses and castles. Today, continue your journey southwards and to the island of Öland. 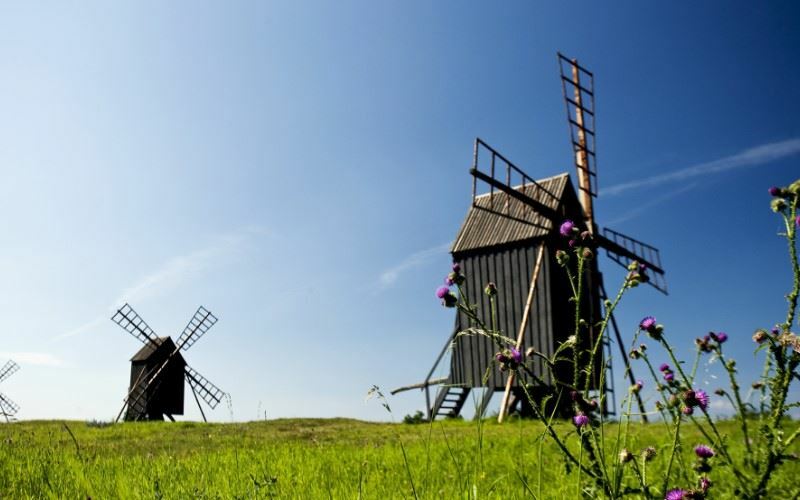 Öland is also famed for its windmills; there are some 350 windmills on the island; and for its ancient castles and countless historic monuments. Day at leisure on Öland. Borgholm, the capital, is located just 2km from your hotel. On summer nights, the town hums with a holiday atmosphere – restaurants and bars brimming with locals and holidaymakers open onto the streets. To the rear of town stands the ruin of 17th century Borgholm Castle. The Castle today, is a fascinating museum which enables visitors to step back in time. From one historical town to another. Your destination today, is the UNESCO World Heritage city of Karlskrona in Sweden’s southernmost archipelago. Clarion Collection Hotel Carlscrona, Southern Sweden. The UNESCO World Heritage city of Karlskrona is spread over 30 connected islands in Sweden’s southernmost archipelago and is considered to be an outstanding example of a 17th century European naval city. Free time in Karlskrona. At every turn impressive churches, former trading and custom houses, charming cottages and parkland can be enjoyed. For many visitors, though, it is the attraction of the Aurora bastion, sites of naval importance and archipelago excursions that draw them to the city. Follow the south coast of Sweden on your way to Ystad. The fishing village of Simrishmamn and the village of Kivik – the centre of the apples and cider region – are worthy of a stop en route. Ystad Saltsjobad, Southern Sweden. Famed as being the base for Henning Mankell's fictional detective Kurt Wallander, and for its medieval atmosphere, the town of Ystad lies on the southern coastline of Skåne. Spend the day on the beach, wander around the cobbled streets of Ystad or explore the south coast of Skåne by car, the choice is yours. The mermaid-shaped Falsterbo peninsula is your final destination on your holiday. The peninsula marks the far southwestern tip of Sweden and is often referred to as the Swedish Riviera. Gasslingen Hotel, Southern Sweden. South of Malmö, on Sweden’s southwestern tip, is one of the most desirable coastal destinations in the country and fondly named as the ‘Swedish Riviera’. Relax and unwind on the Swedish Riviera. Hotspots include the medieval town of Falsterbo and its northern neighbour Skanör which sit behind a six-mile arc of chalk white sand backing onto grassy dunes. After breakfast, return your car to the downtown office in Malmö before taking the train to Copenhagen Kastrup airport for your flight to the UK. The UNESCO World Heritage city of Karlskrona is spread over 30 connected islands in Sweden’s southernmost archipelago and is considered to be an outstanding example of a 17th century European naval city. The UNESCO World Heritage city of Karlskrona is spread over 30 connected islands in Sweden’s southernmost archipelago and is considered to be an outstanding example of a 17th century European naval city. At every turn impressive churches, former trading and custom houses, charming cottages and parkland can be enjoyed. For many visitors, though, it is the attraction of the Aurora bastion, sites of naval importance and archipelago excursions that draw them to Karlskrona. The Clarion Collection Hotel Carlscrona is located in the heart of the city overlooking the waterfront. It is a modern property that ingeniously captures the atmosphere and heritage of the city through the use of natural tones and colourful accessories. The result is a calming ambience perfect to relax in after a day of sightseeing. Famed as being the base for Henning Mankell's fictional detective Kurt Wallander, and for its medieval atmosphere, the town of Ystad lies on the southern coastline of Skåne. South of Malmö, on Sweden’s southwestern tip, is one of the most desirable coastal destinations in the country and fondly named as the ‘Swedish Riviera’. South of Malmö, on Sweden’s southwestern tip, is one of the most desirable coastal destinations in the country and fondly named as the ‘Swedish Riviera’. This is the mermaid-tail shaped Falsterbo pensinsula where you will find the white sand beach and grassy dunes of Skanör, buzzy summer-harbours, golf courses and the medieval settlement of Falsterbo. Skanör is not just a destination for the summer months. During the autumn, migrating birds and grey seals can be observed. Gasslingen Hotel is a small hotel in the centre of Skanör and within walking distance of the town’s beach. The guestrooms are decorated in a traditional style and there is a restaurant, bar and outside terrace and swimming pool. A stay here is about being outdoors and enjoying the natural environment.